Learning Journeys in the Creative Curriculum is an approach that has been developed at Brackenhill Primary School, Bradford and continues to be a genuine whole-school approach. The approach is to construct a Learning Journey over a half-term, based on existing in-school planning (of foundation subjects) – but also allowing opportunities for (e.g.) mathematical fluency and Literacy for a purpose. Using case study materials and existing school planning documentation, our School Improvement Consultant – Sam – worked with the whole staff to develop a classroom display per year group that met a number of agreed criteria. 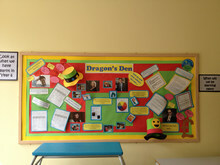 The agreed criteria became a checklist of agreed practice including – for example – a ‘wow factor’ for each half-term’s theme – e.g. Year 5’s link with the local restaurant for their own ‘Come Dine With Me’ experience. 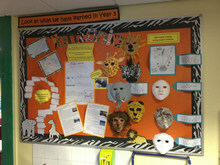 The classroom display ‘builds up’ over the half-term and demonstrates ‘how much we have learnt'. 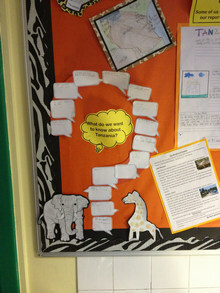 At the end of the previous half-term the children are encouraged to think of their own questions to investigate and these questions lead the learning. 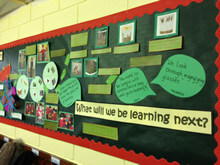 It was agreed that the final display would be transported to the corridor to show ‘how much we have learnt’ across the half-term theme. 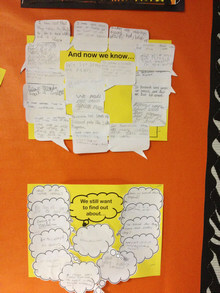 See the Year 5 ‘Come Dine With Me’ plan here (page 2)> plus a news item featuring some other great Learning Journey displays>. Click any of the images to see a larger version. To find out more about how our School Improvement/Mathematics Consultant, Sam Adams, can support Learning Journeys in your school, please contact Sam via email at sam.adams@educationworks.org.uk.